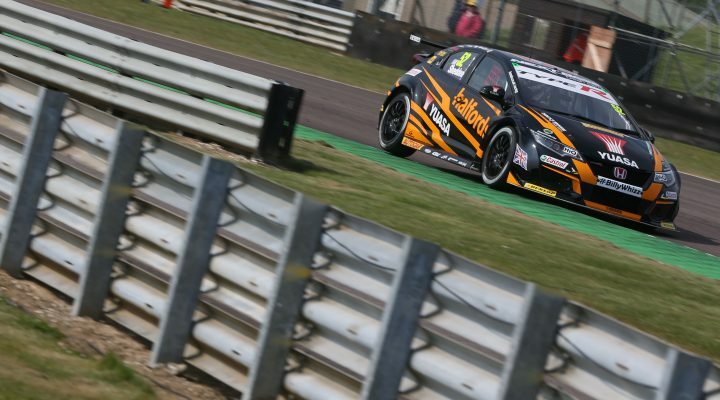 Halfords Yuasa Racing returned to the top of the timesheets as reigning champion Gordon Shedden set the pace in the second Free Practice session at Thruxton. Jack Goff made it a one-two for Honda machinery – albeit for the independent Eurotech squad – as the 26-year-old backed up his earlier pace with another strong showing in FP2. Adam Morgan’s potent Mercedes continues to show good form as the Ciceley Motorsport man produced the third best time, ahead of the impressive Rob Austin in the Handy Motorsport Toyota. Team BMW’s Colin Turkington is looking to cement his championship credentials this weekend, with fourth during practice further boosting confidence. The Ulsterman took a reversed grid win at Thruxton on his way to the title back in 2014, and the WSR man will be pleased with a similar return this time around. Vauxhall’s Senna Proctor looked to be far and away the best of the rookie drivers until he was demoted down the order the by a high flying Luke Davenport in the striking Team Shredded Wheat Racing with Duo Ford. The Motorbase-run squad have experienced a challenging start to the 2017 campaign, but they will have been buoyed by their young gun’s efforts in Hampshire. Andrew Jordan wedged his BMW 125i M Sport inbetween the two rookies to take seventh, whilst Matt Neal and Dave Newsham rounded out the top ten. Neal responded well to a minor mid-session off and Newsham made it two top tens on the day so far. His young team-mate Chris Smiley confirmed the pace of the BTC Norlin Racing Chevrolet with 11th. The all-important qualifying session for Round 7 of the 2017 Dunlop MSA British Touring Car Championship will take place at 16:10, which you see live via www.itv.com/btcc.